This combination of filters and reflectors allows an emission of almost only the desired UVA 1 radiation in the range of 340 to 400 nm (approx. 97%) . 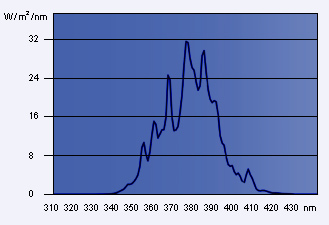 No radiation is detectable below 320 nm (UVB) as well as in the infrared range (J Am Acad Dermatol, vol .45, no. 4, pp. 503-508, Oct. 2001). Additionally, the cold light reflectors are designed to only reflect the desired UV radiation.